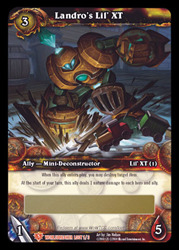 This is a Trading Card Game item, obtained by the Landro's Lil' XT card in the expansion "Worldbreaker." Lil' XT can be quite useful to destroy trains. I suggest using Thrash, Repair, and Tympanic Tantrum. 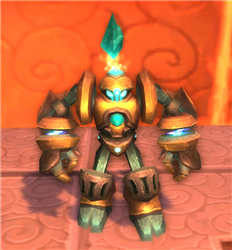 For an all robot team I would use Personal world destroyer and a Warbot or Clockwork rocket bot, or a Clockwork Gnome. The pet itself is able to be sold on the Auction House if you wanted to. You can do this by learning the BoP pet itself from Landro Longshot, opening your pet tab, right clicking on the pet and putting it 'In a Cage'. This turns the pet into a battle pet and allows you to sell it on the AH. This and the original are well known for having the most annoying voice of any Battle Pet. 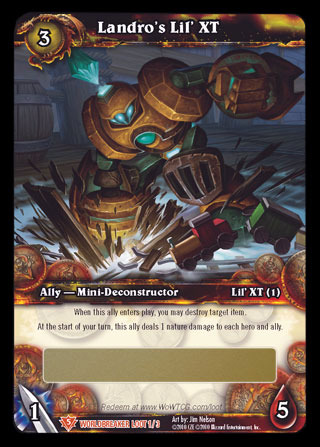 Besides its lvl 25 stats 1465/322/240 it also has a nice combo of heartbroken+tantrum, furthermore (like its blizz store counterpart) it works as a toy train wrecker when summoned. Great to get rid of those anoying "choo choo" sounds when someone deceides to pester a raid/bg group with it.